I had the pleasure of volunteering Saturday at the 26th annual Law Day for Seniors, organized by Senior Legal Services. 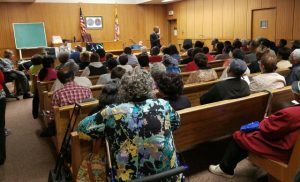 The free event was held at a Baltimore City District Court and was attended by more than 300 Baltimore city seniors. 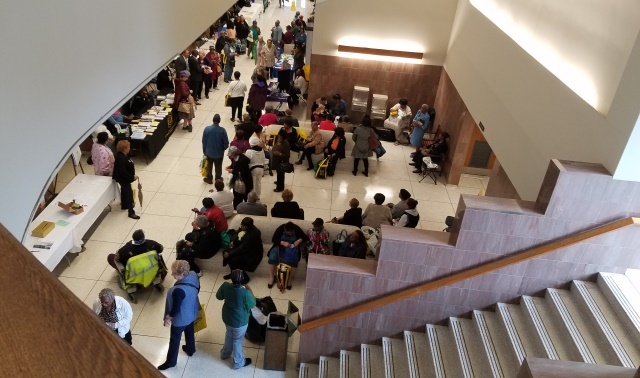 The conference-style programming included seminars on issues such as financial scams targeting seniors, combating nursing home abuse, Baltimore city tax sales and water bill issues and estate administration. Attendees were provided with breakfast and lunch at no charge. The courthouse corridors were packed with various vendors and city agencies, like the Department of Public Works, the Health Department’s Division of Aging and the sheriff’s office. Other pro bono groups, such as Maryland Legal Aid and Maryland Volunteer Lawyers Service, also were involved. Volunteer attorneys and judges made up the panels in the numerous substantive law sessions. I was amazed at how patiently they discussed current challenges facing the elderly in Baltimore and educated the underserved population at risk of losing very basic resources. I was unaware of some of the issues faced by low-income city residents such as tax sales and inaccurate water bills and the predatory liens that go along with non-payment. The seminars included a lively Q&A segment and seemed to leave the seniors feeling empowered to be able to live independently and thrive in their community. It was fascinating to watch how many attendees came with a pen and pad and were copiously taking notes during the presentations. Many expressed how grateful they were for the opportunity to attend this program and felt a little less disadvantaged at the end of the conference. For those who have not heard of the wonderful organization that hosts this event, SLS is a joint program of the Bar Association of Baltimore City and the Baltimore Bar Foundation that provides pro bono legal services to low-income seniors over the age of 60. The handful of staff attorneys at SLS advise and represent clients on a broad range of civil matters including estate planning, consumer and debt collection issues, landlord/tenant disputes, foreclosure prevention, probate and guardianship matters. I was surprised to learn staffers also meet with clients in their homes when disability prevent clients from traveling to the SLS office located in Courthouse East. If you are ever looking to take on a pro bono case or two, I highly suggest contacting SLS.